The first in our Marine Safety Tech Talk series, Marine Rescue and Lifesaving Essentials addresses both rescuing and being rescued on the water. The “rescuing / lifesaving” portion will review the key steps to carry out a successful marine rescue, including accident response steps, Man Overboard operations and a review of the important First Aid skills required. During the “being rescued” discussion a representative from the King County Sheriff Marine Search and Rescue department will talk about rescuing from the responders point of view. Other topics include calling for help, leaving the boat, what to take if you leave the boat and how to get found. Throughout the discussion we will focus on the unique hazards you may encounter while boating and the training and equipment that will allow you to be most effective if an incident occurs. 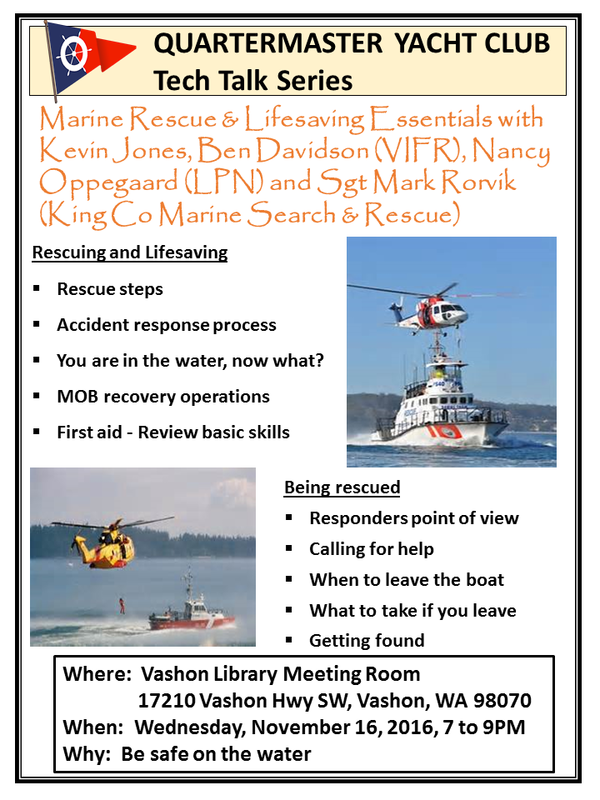 Please bring your questions and experience to this important Tech Talk hosted by Kevin Jones, Ben Davidson (Vashon Fire & Rescue) and Nancy Oppegaard (LPN) on Wednesday, November 16 at 7PM in the Vashon Library meeting room.